Yavanika | Mammootty Online.com - All About Malayalam Megastar Mammootty ! The plot is structured around the search for a missing infamous tabala player of a touring Drama group. Investigation of members of the Drama group reveals complicated sexual rivalries and internal conflicts within the group, yielding several possible suspects to the conspiracy. 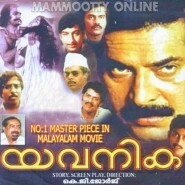 Sub Inspector Jacob Eeraly, portrayed by Mammootty, investigates the missing tabla player, Aiyappan. Bharath Gopi brilliantly portrays Aiyappan, a raging alcoholic and a criminal. Ashokan plays the rebel son of Aiyappan. Other members of the theater group are memorable characters Balagopalan (Nedumudi Venu), Varunan (Jagathy Sreekumar) and many more. Thilakan, established himself as an actor after he got his first State Award in 1982 for his role manager Vakkachan in Yavanika.